DEWALT saws have been designed after extensive testing and jobsite research. The DEWALT DCS391B 20V MAX 6-1/2″ features a powerful 5250 RPM, 460 MWO motor that delivers speed and power to make easy work of even the most demanding cuts. The 0-50 degree bevel special capacity makes it possible to make aggressive bevel cuts in a variety of applications. In the DEWALT 20 volt cordless circular saw, DEWALT has assembled a package suitable for professional users. However, the price is sufficiently low for homeowners who wish to have a professional level circular cordless saw as part of their arsenal. In fact, it is certainly one of the most popular cordless brands today. Compared to the competition, it is heavier by about a pound. 1. How does the DEWALT 20 volt cordless circular saw perform? While there are several manufacturers running 7-1/4′ blades, the standard gauge still remains the 6-1/2 inch. This blade makes it through your 2x material with ease. The DEWALT DCS391 operates on 20V Max battery packs, and has a speed of 3700 RPM running a 6-1/2′ blade. 2. Is this a versatile tool? With this circular cordless saw, make straight and smooth cuts that are accurate even when you don’t have a fence to guide your operations. This is particularly good when speed is not a major concern. Through each cut, the saw has a very stable feel. For the majority of your cutting needs, the 16 tooth standard framing blade will definitely be adequate. If you like using both of your hands, the DCS391B is an excellent left-handed circular saw. 3. Is the DEWALT 20 Volt comfortable when being used? A lightweight yet high strength magnesium shoe provide unmatched jobsite durability for cut accuracy. An optimized rubber comfort grip gives the user total control and optimal balance. This is also suitable as a left handed circular saw. 4. 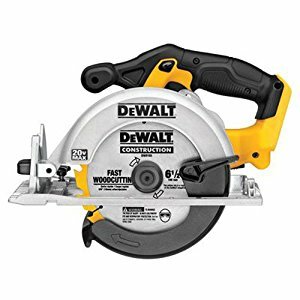 How durable is the DEWALT 20 volt cordless circular saw? For increased durability and for resisting contamination, the DEWALT 20 Volt uses a double oil sealed shaft. It also comes with a handy hard plastic case designed to hold your saw, extra battery, and charger easily. For construction professionals, DEWALT offers a full range of saws that will meet all cutting needs. They have a proven track record of performance based on their innovative technology. When it comes to cordless everyday tools, DEWALT tools outrank their competition by far. Even as a pro, you will enjoy the accurate and smooth cutting offered by the DEWALT DCS391B 20V MAX 6-1/2″. This is a highly recommend tool if you are looking for a versatile new circular saw!